Monday was an eventful evening in the world of politics — Donald Trump announced his new nominee to replace Justice Kennedy on the Supreme Court, and “The Late Show with Stephen Colbert” returned from hiatus to make fun of Trump after every single late-night show took last week off. Colbert didn’t know that Trump picked Brett Kavanaugh when he taped the show since the taping was several hours before Trump’s primetime announcement. Instead, Colbert chose to express some doubt over whether Trump’s brain is up to the task of making a good decision. That doubt wasn’t just general dissatisfaction with Trump — although that’s certainly a big part of it — but also Trump’s mind-shatteringly bizarre Elton John comment at a rally last week. You’ve probably seen the quote by now, but for those who haven’t, here you go. And, yes, this is 100 percent real. Colbert played the full clip on “The Late Show” Monday night, and you really should watch it because it’s somehow even weirder to see him actually say it than it is to read it. Colbert then decided that he wasn’t properly equipped to discuss Trump’s Elton John thing any further. 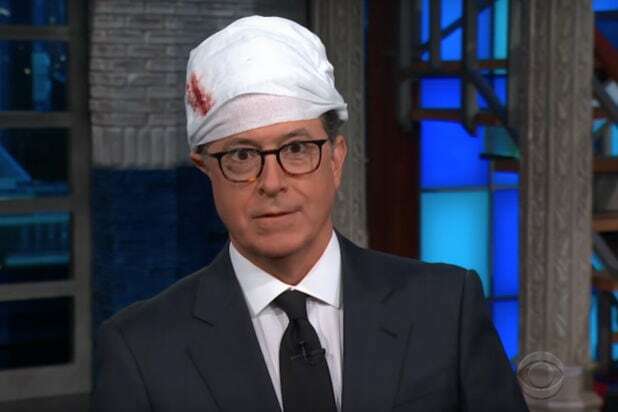 Then Colbert got into character by putting a big bandage on his head. You can watch this portion of Colbert’s monologue from Monday’s episode of “The Late Show” in the video embedded at the top of this post.